Thomas Carlyle is one of the most important writers and philosophers of Scottish origin who published his works during the Victorian Era. Born on 4 December 1795, the writings of Carlyle range over a multitude of topics, including philosophy, mathematics, history and satire. He has also been credited with some of the best translations of his time and while alive, he was a renowned teacher as well. Carlyle was born in a time when Calvinist beliefs were gaining popularity in Scotland. His father, a firm believer of Calvinist ideology and a reputed member of the Church, was able to send him to the reputed Annan Academy for his early education. However, he left the school after three years due to excessive bullying and later on joined the University of Edinburgh, from where he completed his education and became a mathematics teacher. After working as a teacher of Mathematics in Kirkcaldy, Carlyle returned to the University of Edinburgh in 1819. At that time, he had lost all faith in the religious ideology that he had followed as a child. He decided to leave clergy and dedicate his time to writing. In 1821, he wrote Cruthers and Jonson, which was his first work of fiction. However, he dismissed the realist novel and started working on translations of some of the most important literature available at his time. He translated Goethe’s Wilhem Meister’s Apprenticeship and many other notable works. In 1826, Carlyle married Jane Baillie Welsh after a courtship of four long years. He combined the experiences of his life, his loss of faith and feelings of loneliness along with his experiences with his wife into his first major work of fiction- Sartor Resartus. Carlyle started working on this as a commentary of fashion and had planned to write only one chapter. However, as he started, he was able to finish a complete novel that gained recognition for the first time in 1833-34 when Frazer’s Magazine started to publish it as a series. 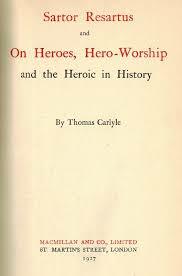 By then Carlyle had come up with his own style of writing, a combination of fiction and commentary, that had started to draw attraction of critics as well as readers. With the popularity of Sartor Resartus, Carlyle became a major writer of the literary scene of the Victorian era. He moved to London in 1834 and by 1837, he had completed a three-volume critique called The French Revolution: A History. In this work, he presented a detailed account of the events of the French Revolution in such a way that it acted as a medium of filling the people of Britain with hope for the future. 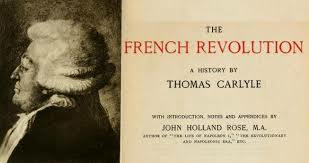 The French Revolution became another major work of Carlyle that brought him popularity but the financial gains from the work were very limited. In order to solve that problem, Carlyle started to deliver lectures, even though he never liked it much. His course of lectures covered the lives of a number of popular figures including Shakespeare, Odin, Dante, Rousseau and many more. One of the most important among these lectures was that on Muhamad, which rose him to fame immediately. He presented four courses of such lectures and used the notes from the last one to write another famous book On Heroes, Hero-Worship and The Heroic in History, that won him a Nobel Prize. The book was published in 1840 and had a number of important quotes. Carlyle was mostly a writer of prose but has written three major poems. These are Today, Fortuna and Cui Bono. All these poems discuss the nature of life and happiness. In the poems, Carlyle uses beautiful language and vivid scenic descriptions to establish the idea that life and happiness are short lived. He emphasizes on enjoying them as long as they last. His poetry resonated an entirely different philosophy but the style of writing reflects his satirical style and his commentary of life and society, that has been used by him in almost all of his prose work. As he rose to fame and established himself as an important writer and philosopher of his age, Carlyle had accepted a reputed role in the University of Edinburgh in 1866. However, a few months later, his wife died. This event changed the course of his life and he decided to spend the rest of his days somewhat detached from his social surroundings. He died on 5 February 1881 at a ripe age of 85 and was buried in Ecclefechan, according to his wishes.